Over 23, but Still Want to Participate? Help us by spreading the word! Tell your friends and family, your colleagues, your boss. Post our e-Postcard on Facebook! Blog and Tweet about us. Share IHTD films with your friends. Click the orange link on the bottom right hand corner to follow ihtd.org! Like us on Facebook, and follow us on Twitter! Do you and an organization you work with have a cause that’s close to your hearts? 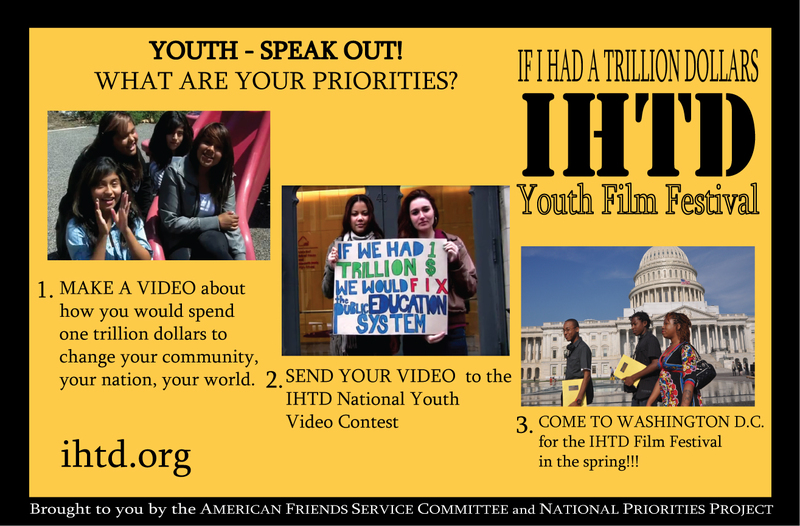 Ask your young employees and interns to make a video about how they would spend a trillion dollars for your cause! Not only will they be able to enter it into the IHTD film festival, but they will have made a three-minute video that you can reuse for your organization. Are you affiliated with a magazine, newspaper, TV network, or radio show? We would love to be your next story! Contact us for more information. Donate to IHTD! Last year’s film festival was a $15,000 operation, which is a big strain on two non-profit organizations. Help this year’s festival run smoothly. Click here to donate now!